Fees for dental and oral surgery services. Veterinary dental services are of extremely high value for clients. 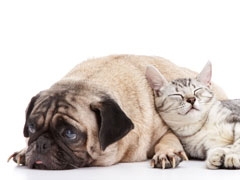 The veterinary dental specialist is very thorough and can provide peace of mind. The dental and Oral Surgery consultation fee is $125. Every effort is made to discuss oral health problems, potential treatments, costs and to help owners keep their pet's mouth healthy. The dental consultation will include discussions of treatment options for your pet while under anesthesia and in the immediate (same-day) post anesthesia period. The goal of the consultation is to help pet owners make the optimal decisions in the treatment of their pets. We provide an inital dental consultation to perform an awake pet exam, and to discuss client concerns. At this time potential treatment options are discussed in detail. Under anesthesia a thorough exam is performed with dental radiographs, periodontal probing and dental charting. At this time every tooth and the sourrounding soft and bony tissues have been evaluated. The pet's periodontal disease status and endodontic (inside the tooth) health have been determined. If problems were identified that were not anticipated and discussed during the initial consultation, Dr. Kressin calls the owner's cell, home or work phone. At this time any concern is again addressed. We try to include the owner in decision making whenever possible to make the best decisions. Fees are based on: time, materials (dental, surgical, patient comfort, monitoring and safety) technical assistance and facility requirements. Fees are outlined with written estimates in most cases and updated by telephone when possible. Fees are honest and fair! We are often requested to provide payment plans and we do so through CareCredit. You can make these arrangements prior to, or during the initial dental consultation. Clients often ask how to prepare themselves or their pets for the visit. Our hospital policies are available on this site. We recommend pre-anesthesia blood screening to include either PCV with TS, or hematology with blood cell differential and blood chemistry.